Pecans resemble walnuts but tend to be longer, more slender, and smoother in appearance. Their shells, which are shaped like large pills, are spotted brown, smooth, and are thinner and easier to crack than walnut shells. Pecans have played a large role in the diet and cuisine of the cultures native to pecan growing climates. Many Native American tribes relied on pecans as a staple food in the fall and winter months and even traded pecans monetarily. In the 18th and 19th centuries, Spanish and French colonists began cultivating pecans and eventually began exporting them to other parts of the world. New Orleans, which was a major seaport, is situated right in the heart of the pecan tree’s natural habitat and became a major player in the growing pecan market of the 19th century. Pecans still play a large role in the culture and traditions in the southern United States. From pecan pie to pecan flavored coffee and ice cream, pecans are part of the South’s rich culinary heritage. Pecans are prized for their high levels of antioxidants and omega-6 fatty acids, both of which are thought to protect heart health, lower cholesterol, and aid in disease prevention. A study published in the September 2001 issue of the Journal of Nutrition found that eating a handful of pecans per day had cholesterol-lowering effects similar to leading cholesterol medications. Pecans are also high in protein and fiber while low in saturated fat, which makes them a popular alternative protein source for vegetarians. Pecans are also high in many vitamins and minerals including thiamin, magnesium, phosphorus, and manganese. When purchasing pecans in the shell, look for shells that are smooth, undamaged, and uniform in color. Shelled pecans should look plump, uniform in color, and never dry or shriveled. After purchase, unshelled pecans can be stored in a cool, dry place for up to 12 months without compromising freshness. Shelled pecans should be stored in the refrigerator or freezer and in an air-tight container. Pecans stored in the refrigerator will remain fresh for approximately nine months, while those stored in the freezer will keep for up to two years. Frozen pecans can be thawed and refrozen multiple times without compromising flavor or texture. 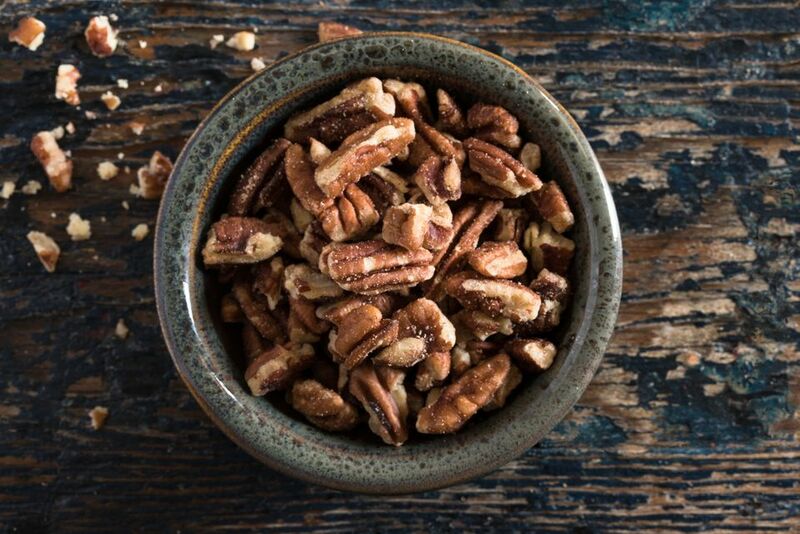 Shelled pecans should only be stored at room temperature for up to two months and should always be in an air-tight container to keep out moisture and pests. Although pecans are harvested in during the autumn months, they are available for purchase year-round. Most major supermarkets carry pecans, either whole or in pieces. Pecans are most often stocked in the baking aisle with other nuts and baking chocolates. Pecans are also a popular item for bulk bins with other nuts and dry goods. During the holiday months, pecans are usually stocked more heavily as they are a popular item for holiday desserts and snacks.